Marble Arch is one of those iconic buildings, within the Unfinished City, that I find intriguing. Not because of its design, but because of its location, which is not where it was first installed. The triumphal arch was designed by John Nash, in 1827, and was designed to be the entrance to the Court of Honour, at Buckingham Palace. Work on its construction began the same year, but was suspended in 1830, due to spiralling coasts. Work began again in 1832, to a modified design which removed the attic stage, sculptures and statue of George IV, which would have stood atop the arch. The arch was finally completed in 1833. The entire structure is clad in Carrara marble, which gives the monument its name. Following the accession of Queen Victoria, in 1837, Buckingham Palace was deemed too small for her growing family, so plans were put in place to expand the building. The arch, which stood roughly where the east-face of the palace, with the royal balcony, now stands, had to moved to make way for the expansion. Thomas Cubitt was charged with the dismantling, and relocating of the arch, when work began on the palace in 1847. Cubitt relocated the structure, which was completed in 1851, to Cumberland Gate as the entrance to the northeast corner of Hyde Park. The gates, originally designed to be covered in mosaic gold, are made of bronze and show sculptures of a lion, at the top. 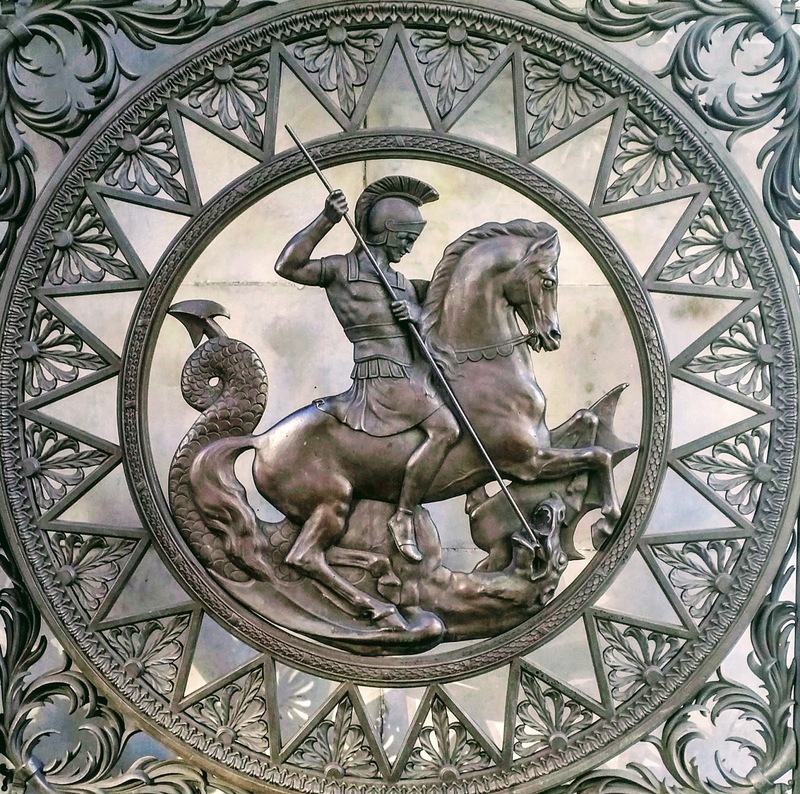 George Iv's cypher, on the middle, and St. George slaying the Dragon, at the bottom. There are three small rooms, within the arch, that were used as a Police station from 1851 until, at least, 1968. The royal constables of Hyde Park were first to utilise the rooms, before the Metropolitan Police moved in. In 1953 Queen Elizabeth II passed through the arch, in her gold state coach, during her coronation. The site on which Marble Arch now stands is close to the site of the Tyburn Tree. Some of the unused pieces of sculpture and friezes were used at Buckingham Palace, while the victory statues were put on display at the National Gallery. The statue of George IV, which sits atop a plinth in Trafalgar Square, was installed in 1843.